On March 29, 2013, with the aim of looting and arson in Gopalganj village of Shyampur Union the Awami terrorists, Police, RAB and BGB attacked. Police and Awami Terrorists fired indiscriminately when villagers formed resistance against them. 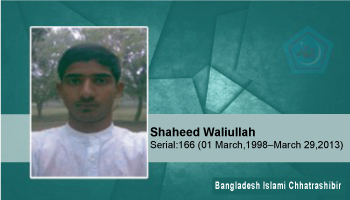 Waliullah, a class 10th meritorious student of Shatnagar Dakhil Madrasa and Shibir activist, , was martyred in their firing.